In the late 1960s American detective author Erle Stanley Gardner stood before a collection of over 30,000 figurines. He had heard about this collection many years ago and felt a deep sense of astonishment when seeing it in person at this modest house in the small rural town of Acámbaro in the state of Guanajuato, Mexico. Gardner, the writer who came up with great titles like The Case of the Black Cat and Granny Get Your Gun, and who created such memorable characters as Perry Mason, Della Street and Lester Leith had a real life mystery in front of him. The figurines were fantastic and seemingly out of place. Many of them featured people of various races and some 10 per cent of them looked like our modern depictions of dinosaurs. These dinosaurs were sometimes accompanied by humans; some of the figures had dinosaurs wrestling with people or men even riding dinosaurs. Of course, dinosaur representations in ancient art were unheard of because humans did not coexist with these prehistoric creatures. The creator of Perry Mason, who was considered to be the best-selling American author at the time of his death, was asked to examine the collection by a friend, the Harvard-educated anthropologist Charles Hapgood, who was one of the many voices chiming in on this controversy at the time. Hapgood knew that Gardner’s love of sleuthing did not just apply to fiction writing and Gardner’s many years as a trial attorney would be helpful in solving the mystery of these anomalous figurines. Over the years the massive collection has been proclaimed to be an elaborate hoax by people in the more traditional fields of science and has been shunned by most mainstream archaeologists. 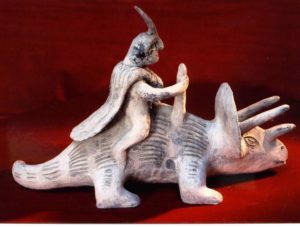 While many have thought that the whole discussion was put to rest years ago, the Acámbaro figures have begun to generate interest again among fringe scientists, Christian “young earth” proponents, believers in alternative universe theories and those who follow the “New Chronology” writings of Russian Anatoly Fomenko which claim that written history itself has been adjusted over time to fit the agendas of the elites. Some investigators in more traditional scientific fields have also been recently drawn to these figures once again, as the controversy has become debated online. The figures, which for many years have been literally and figuratively “crated up” and not been available for examination are now on display for all to see at the Waldemar Julsrud Museum in Acámbaro, Guanajuato. The story of the Acámbaro figurines begins in 1945. A German merchant named Waldemar Julsrud was riding his horse along the edges of a mountain called El Toro just outside of town. In a dried out riverbed he noticed an unusual part of a clay figurine sticking out of the dirt. He began digging and found a number of curious figures near the riverbed. 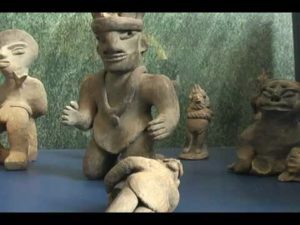 Julsrud was already familiar with pre-Columbian ceramics as he had one of the largest collections of artifacts from the pre-Classic Chupicuaro culture then amassed. While he wasn’t selling hardware, he was digging up or acquiring pieces for his collection and over the years Julsrud became quite the amateur archaeologist. 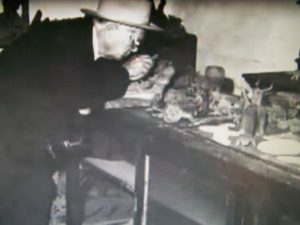 He had never seen the types of figures that he had uncovered at the base of El Toro, so he asked one of his employees named Odilon Tinajero, if he could find more of these figurines for him. 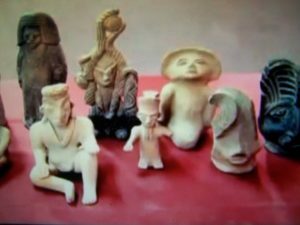 Julsrud would pay Tinajero one peso for each figurine brought to him intact or with pieces that were easily put together. Thus began his collection, and over a 5 to 6 year period, Julsrud gathered over 35,000 of these strange figures. In 1947 when Julsrud published a booklet on his discoveries called Enigmas del pasado – Enigmas of the Past – the figurines began to receive international attention. In March of 1951, Lowell Harmer, a veteran writer for the Los Angeles Times published an article titled: “Mexico Finds Give Hint of Lost World: Dinosaur Statues Point to Men Who Lived in Age of Reptiles.” Harmer had visited Acámbaro earlier that year and described the sheer volume of the collection in Julsrud’s house wrote that the figurines “filled the floors, the tables and the wall cabinets to overflowing.” The Times writer also wondered in his article, “How could it be a hoax? Not even in Mexico, where money is so scarce, could anyone afford the labor of these thousands of statues at the low prices Julsrud is paying.” While seemingly convinced of the collection’s authenticity, as an objective writer Harmer finished off his article by saying, “I am a writer, not an archaeologist. It will be up to the experts to decide.” In the next few years the story was picked up by the tabloid press and made it to the magazines specializing in stories of the fanciful and the bizarre. One article of note appeared in the February/March 1952 issue of Fate magazine titled “Did Man Tame the Dinosaur?” A clear reference to some of the figurines showing men roping and riding the creatures. The following year, 1953, the Mexican government got involved in the Acámbaro mystery. 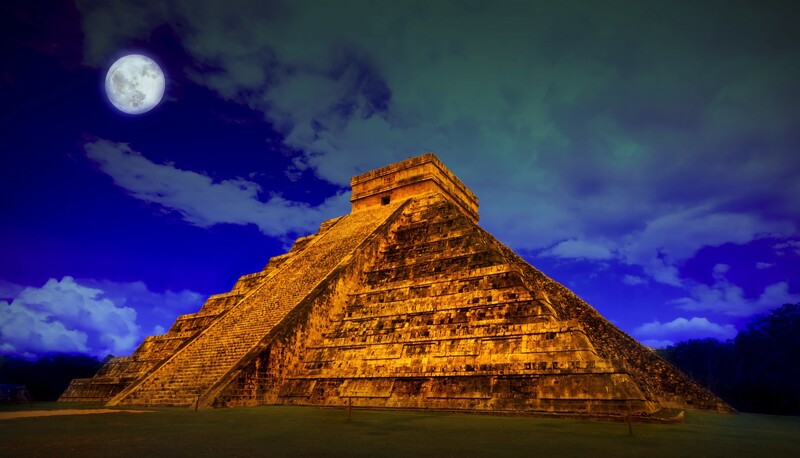 It sent 4 archaeologists from the Instituto Nacional de Antropología e Historia – also called INAH – in Mexico City to investigate. They set up a dig site about a mile from Julsrud’s original discovery location near the base of the mountain called El Toro. They dug a test put going about 2 meters down and discovered dozens of figurines similar to Julsrud’s, including dinosaurs. 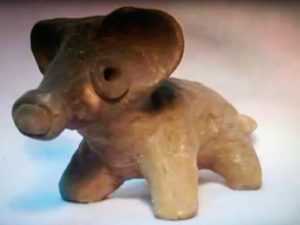 INAH then issued a statement that the figurines did correspond to the pre-Classic civilization of the Chupicuaro and could date to as early as 800 BC, but not the dinosaur ones. The scientists concluded that even though the dinosaurs were found among other similar figurines in the same archaeological strata, they couldn’t possibly be anything but modern productions as human interaction with dinosaurs was impossible. The Instituto did no further excavations and after the 1950s refused to issue permits for other archaeologists to make new excavations. It was not long before Di Peso’s articles and claims were shot full of holes. For one, Di Peso only spent 2 days in Acámbaro and only spent 4 hours examining Julsrud’s collection in his home. Di Peso did not set up and conduct an excavation on his own. He also did not take into consideration that Julsrud’s collection included near-perfect figurines purchased from villagers as per Julsrud’s own request. When he began his collection, Julsrud specified that he would pay one peso for each intact figure. There were plenty of pieces and broken figures that did not make it to the over 30,000 in Julsrud’s home. As a scientist, Charles Hapgood knew of the need for concrete dating of the pieces using the most up-to-date methods. In 1968 he submitted three samples to Isotopes Incorporated of New Jersey for radiocarbon dating. The first sample came back as three thousand five hundred and ninety years old, plus or minus 100 years. The second sample came up as six thousand four hundred and eighty years old, plus or minus one hundred and seventy years. The third sample came up with a date of three thousand and sixty years old, plus or minus one hundred and twenty years. To be thorough, Hapgood also submitted four samples to the University of Pennsylvania Museum for thermoluminescent dating, a more accurate way to date pottery. All four samples came up with a date of 2,500 BC, plus or minus one hundred and ninety years. Dr. Froelich Rainey, realizing the importance of accuracy in the dating of these pieces did 18 runs on each of the 4 samples and came up with the same results. he last attempt to date the figures occurred in 1976. Gary Carriveau and Mark Han also used the thermoluminescent dating technique on 20 of the figures. 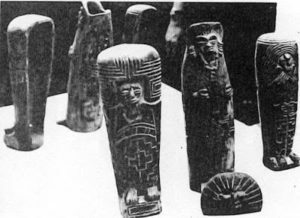 All of the samples failed the “plateau test” which indicated that dates obtained from these figurines using high-temperature thermoluminescent dating were not reliable and lacked significance. Based on the signal regeneration found in some of the samples, the Carriveau-Han team estimated that the figurines were fired sometime in the late 1930s or early 1940s. So, are these dinosaur figurines authentic archaeological finds of great importance, or are they part of an elaborate hoax? One must ask if this were a hoax, who would benefit from it? Waldemar Julsrud made no money from the sales of the figurines or from tourism connected to his collection. No archaeologists have made names or reputations for themselves because of the dinosaurs of Acámbaro. The Mexican government wants to ignore these figures and prohibits any excavations in the area. Why do they not want more investigation into these figures? As with everything presented on Mexico Unexplained, I encourage you to do your own investigation. Maybe you can finally solve the enigma of the dinosaurs of Acámbaro. Wow! Fascinating. I tend to prefer to think that Hapgood’s testing was accurate…Only because I want it to be. I’m one of those crazy “young earth” Christians! Another interesting and thought provoking article/audio show Robert. Thank you. Why would they be afraid to excavate the site again? Even as an atheist, it is important for us to know whether if this is true or a hoax. I am prepared to have my beliefs shaken if these were real and that it disproves evolution. It is important that we know the truth. I hope they conduct more study on this artifacts. If more investigation proves the figures to be real, the scientific world will be turned upside down. Many (most?) scientists don’t want to search for the truth, they want to preserve the orthodoxy their careers were built upon. That makes no sense. The scientist who first proves evolution or natural selection or Darwin wrong will get a Nobel Prize, probably the Templeton Foundation fat prize too, and will be the most famous scientist around the world. Figurines and pottery found in South America present similar details indicating dinosaurs co-existing and concurrent with human. In science, the facts should be allowed to be presented and evaluated fairly. Unfortunately in these days facts that do not support current consensus positions are generally disregarded by the mainstream that is invested such. Concepts or facts that support creationism or intelligent design models are frequently omitted from reports and studies in an attempt to retain government funding which is largely predicated on a status quo. Tim, you are quite right about the current state of “science.” There is so much out there we just don’t know and the people who we think should have the most open minds (the “scientists”) are often the ones who are most dogmatic (they have careers to defend, and as you mention, there’s that government $$$ that has to keep flowing). Even without such evidence in Mexico for recent dinosaurs, preserved T-rex bone marrow has been found in Montana. Not to mention a Stegosaurus carving at the Ta Prohm temple in Cambodia, and other findings such as screws, hammers, electrical 3-prong plugs, etc. and other tools found encased in rock and stone. There are tons of anomalies out there. There are people who even allege the dinosaurs never really existed and that these bones are of contemporary, historical creatures. Who knows? If a person believes the Bible to be the “Word of God” presented to mankind; then an important fact comes into play. According to the Bible mankind did not eat animal flesh until after the flood of Noah’s day. Prior to that time animals had no reason to fear mankind; nor the desire to hurt mankind. Hence mankind and the creatures portrayed in the collection could well have harmoniously co-existed for a considerable period of time (over 2000 years). That time period (before the flood of Noah’s day) would have been consistent with the dates given for these figurines. So, that which seems impossible, may not have been so. Additionally, we tend to think of ourselves as highly educated and talented in our day. But those living prior to the flood lived (in many cases) ten times as long as we do today. They didn’t have our type of education, but I’m willing to wager they were very talented at that which they chose to do. Making such figurines would have been child’s play to them. You’ve given us a lot of food for thought. Thank you for the comments. I really appreciate your contribution here. Interesting points, but given the size (foot long or less) range of these objects, and considering the forces of erosion from moving water, these items had to be manufactured after the Genesis flood in order to survive. (Even the great Pyramid of Egypt would have been eroded to an unrecognizable mass by the Great Flood.) 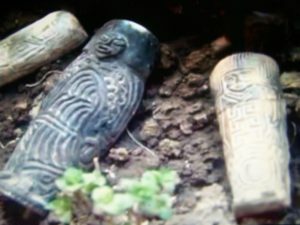 I also understand that several figurines have been found in adobe mud placed prior to the discovery of the hillside where these were found in 1944. I think it rather telling that most of the collection has since been placed under lock and key, out of the public eye. If they were presumed to be a hoax or recent manufacture, why would they do this? It only makes sense that someone is afraid that they really are genuine, and that someone is fearful of the ramifications to ‘modern science’ as pointed out by Mr. Hall in the comments above. I totally believe these artifacts are Pre-flood of Noah\\\’s day. I think they are hidden away to keep people from believing what the Bible says about the demons materializing human bodies and co-habitating with human women[Genesis Chapter 6]. 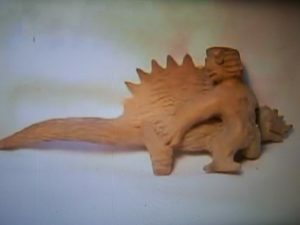 My guess about these figurines is that the demons made themselves into animals[dinosaurs], too… There was a huge vase on \\\”Antique Road Show,\\\” a while back. It had a face on it like some of these figurines-wide face and mouth, really ugly. What struck me were the handles… they were almost identical to the Acombara figurines with the super long necks…And the clincher was this: the antique dealers gave this big, ugly clay pot a value of… you ready? ****$250,000*** WHAT??? And more importantly, WHY??? What in the world would make it so valuable? The antique dealers claimed it was from the 1800\\\’s of the location: \\\”Ohio River Valley\\\” where you happen to find the \\\”Mound Builders.\\\” Interestingly, there are many reports from the eighteenth and nineteenth century newspapers of giant bones[Nephilim, anyone?\\\” being found there. [See the books on giants on Amazon] Ok. So why would a ugly old vase be worth a quarter of million dollars that\\\’s from the 1800\\\’s? I told my family this and I\\\’ll tell you all…. it\\\’s because these dealers knew exactly the time period the vase was from but because of peer pressure they couldn\\\’t[or wouldn\\\’t] say. The creatures on the handles look exactly like the Acambaro figurines… Google it, I have and found the vase so you can see it for yourself. Scientists are under the same pressure as mentioned above. Peer pressure…to not believe in creation and what the Bible says… Bonus: Check out the movie \\\”Exodus: Patterns of Evidence.\\\” I learned the truth from the Bible thirty years ago from Jehovah\\\’s Witnesses, so please, check out our website, too. Go to: Bible Teachings>Science and the Bible>See interviews and articles. Ok, it was appraised in 1998 at $30 to $50 thousand…Sorry about that but but still quite substantial. My daughter and i are watching the show right now[about 3 hrs after my last post] S18:E21 Two giant vases from the same time in western Pa are worth about $1000. Please have Linda call me directly about the NHE in crafts flying in and out of clouds forming characters depicted in figurines all over the world including Babylonia and Acambaro. I have several photos I have shared with several individuals of the manufactured images in the clouds which cannot be natural and resembling exacting images of Evil figurines.